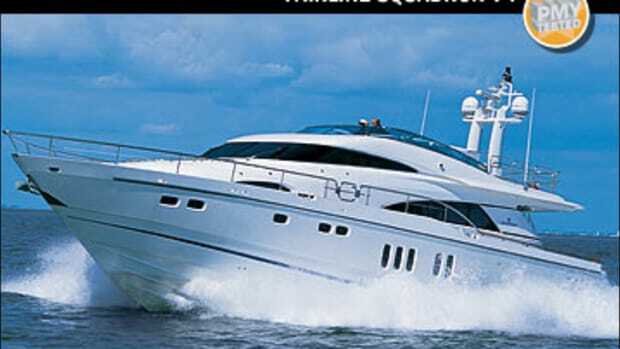 When a PMY editor tests a boat, he or she is supposed to approach it with an open, unbiased mind. Of course, this is impossible. Being human, we can&apos;t avoid preconceptions. Every time we step aboard, we take along our notebooks, measuring tapes, inclinometers, dB meters—and yes, our baggage, which we try our best to ignore. 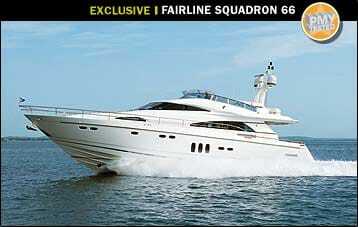 My wring-out of the Fairline 66 Squadron was like that. Before I boarded her in Fort Lauderdale, Florida, I&apos;d been aboard her in Southampton, England, and was impressed by her luxurious interior. 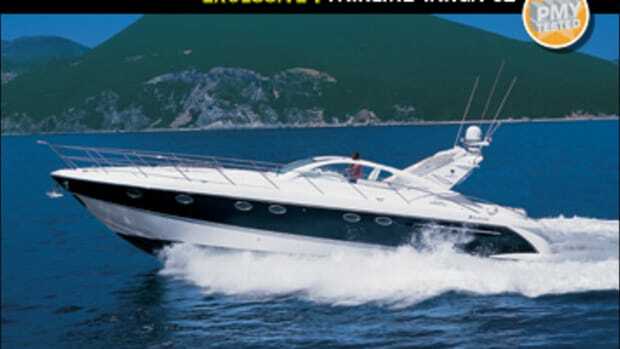 Before that, I&apos;d driven a number of Fairlines, including the cushy 43 Phantom PMY had for a summer. 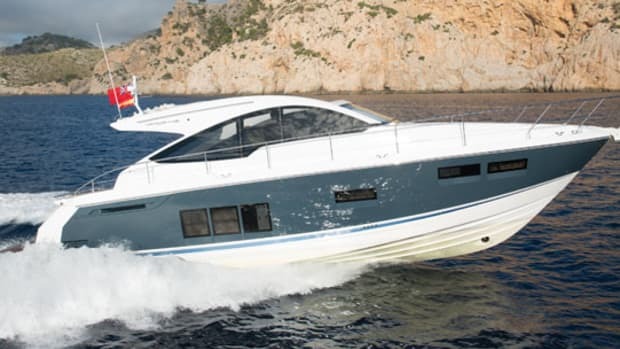 Before that I&apos;d been to the factory in Oundle, England, and seen how Fairline lays up its hulls and finishes its joinery. 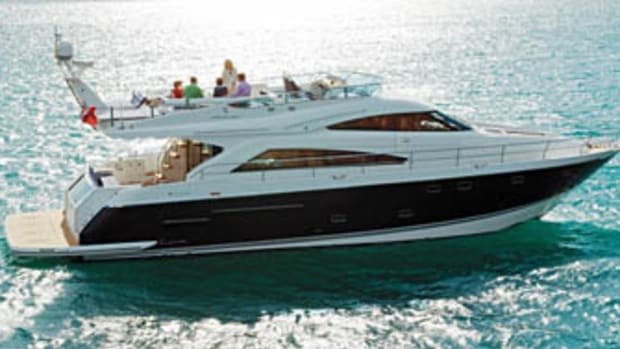 But a different impression resulted from a conversation I had with Fairline product manager Alan Masters at the 2006 Miami International Boat Show. Learning I was about to test the boat he helped create, he offered to send me Fairline&apos;s own test results: speeds, fuel consumption, and sound readings. This is rare. If I ever get factory numbers, it&apos;s usually after my test, and usually because someone wasn&apos;t entirely satisfied with the outcome. When the document arrived and I realized I&apos;d be at the wheel of a luxurious, 80,000-pounder that topped out around 38 knots, I had a feeling my experience would be different from all the others. As it turned out, the top speed I got on test day was about 2 knots shy of what Masters and his team got during their evaluation, and yet I was anything but chagrined. 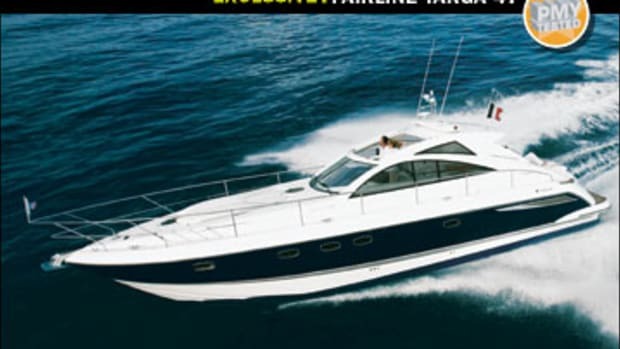 Our 66 planed without hesitation, never pounded on any heading, knocked down every hint of spray, and heeled into full-throttle turns like a 30-foot sportboat. Quiet and comfortable, she was also brutally effective at squashing the three-footers like so much roadkill. This hull is so good at slicing and dicing, in fact, you forget you&apos;ve got four staterooms and three heads underneath you. No wonder that despite her standard two-berth crew quarters abaft the engine room—but without direct access to it—the 66 was designed to be run by a couple. Credit for all those knots goes partly to optional 1,550-hp Caterpillar C30s, which of course don&apos;t come cheap: 175 gph at full roar. But there&apos;s another cost: They&apos;re big—even for an engine room of this size. You must lay over them to add coolant to the outboard reservoirs, the air-conditioning compressors are buried beneath them in the forward corners, and I never saw the raw-water pumps, much less reached them, because the engines are so close to the forward bulkhead. I liked the engine-mounted auxiliary instrument panels, but they&apos;re at thigh level, and with just over a foot between the engines, you can&apos;t even squat down to read them. Yet the engine room is well insulated, including the outboard fuel tanks (so I couldn&apos;t tell if there were access plates, but there were definitely no sight gauges), it has an effective 24-volt fan system and 6&apos;3&apos; headroom, and its Racors and clear-top seawater strainers are clustered aft where you can quickly check them. So is the 27-kW Onan genset, right under the 24-volt breaker panel. It&apos;s just that the Cats are big. Standard 1,100-hp V-10 MANs are shorter, but also wider. 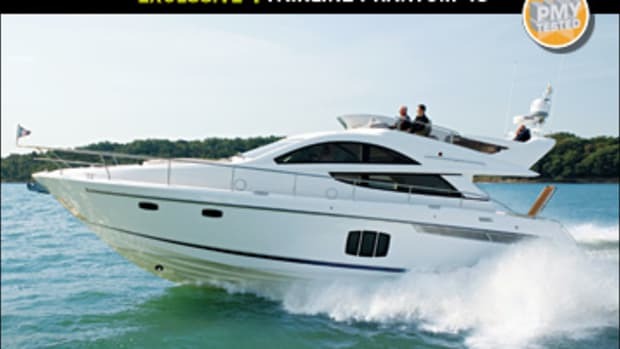 Anyway, while your mechanic&apos;s tending to business down there, you can launch your PWC from the garage (also available as a utility room), launch your 10-foot RIB from the bridge using the standard davit, or just hang off the two-foot-deep teak swim platform, which is part of the running bottom and so provides extra lift for better planing. Or maybe you&apos;ll want to lounge around the ten-foot-deep teak (standard) cockpit, which is covered by the very cantilevered bridge overhang that holds your RIB. If it&apos;s really nice, you could stroll up the well-bulkwarked, 13-inch-wide side decks (teak optional) and lay out on the standard foredeck sunpad. Don&apos;t worry if it&apos;s a little rough; it&apos;s surrounded by a beefy stainless steel rail. In fact, if anyone ever tells you to get a grip on this boat, you won&apos;t have to go far. There are grabrails everywhere, outside (including a big circular one outside the saloon-cockpit door) and in, and God bless Fairline for it. 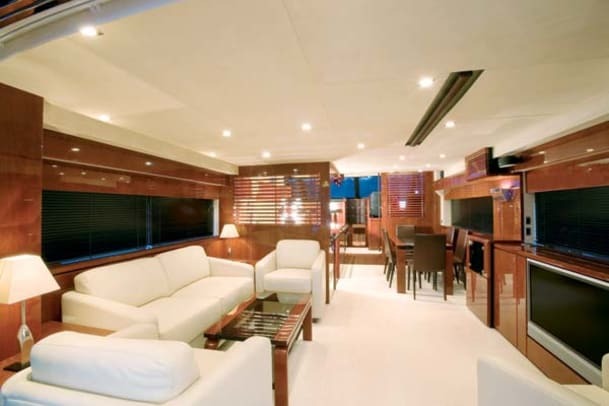 The inside grabrails—I counted seven—are especially nice because they&apos;re wrapped in dark leather with baseball stitching, a theme borrowed from the Squadron 74 that repeats throughout the boat, down to the master-stateroom reading lights. Even the galley and lower helm soles are leather. Combined with lots of beautiful dark cherry, it creates an effect somewhere between Park Avenue apartment and old-line yacht club—luxurious, comfortable, inviting. Adding to the feel are elegant light and plumbing fixtures, free-standing saloon furniture, and a single-level saloon. 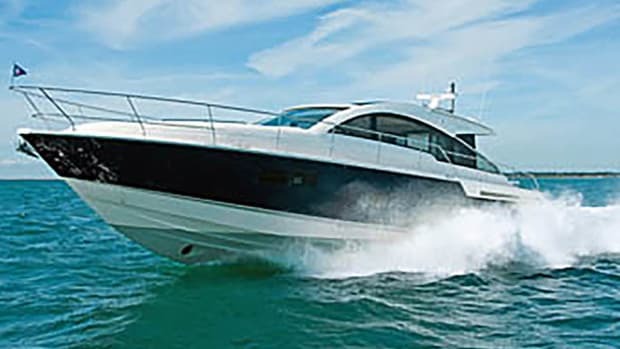 Unlike many builders, Fairline doesn&apos;t use valence air conditioning outlets. Cool air for the saloon enters through two large circular vents—effective, but a bit more air noise. The port-side galley, forward and across from an elegant dining table for six, is screened from the saloon by a slatted cherry divider and is way cool. 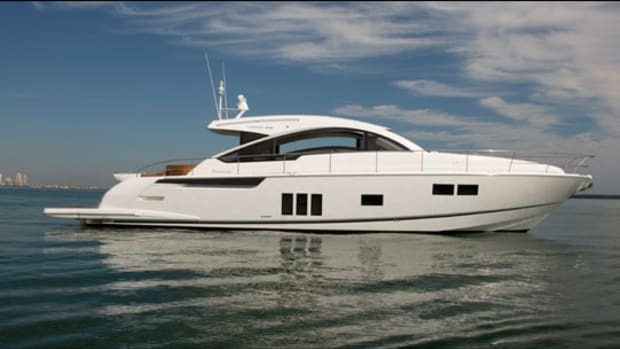 It has high-end appliances, Avonite countertops available in a staggering choice of colors, a panographic door leading to the port-side deck, and an inboard island that provides workspace and cabinets for stuff like the standard china, flatware, and crystal. But the outboard cabinet, which holds the deep two-compartment sink (the smaller for the standard disposer) and four-burner cooktop caught my eye. It has two bamboo chopping blocks that slide along metal rails to cover whatever you&apos;re not using or remove altogether. Talk about maximizing space. Forward and up two steps is an L-shape shelf with two stools that provide a view out of the windshield and communication to the helmsman, who&apos;s screened from the dining area by another cherry divider. I wondered about having stools instead of a settee but was told that Fairline fitted them because they proved so popular on the 74. 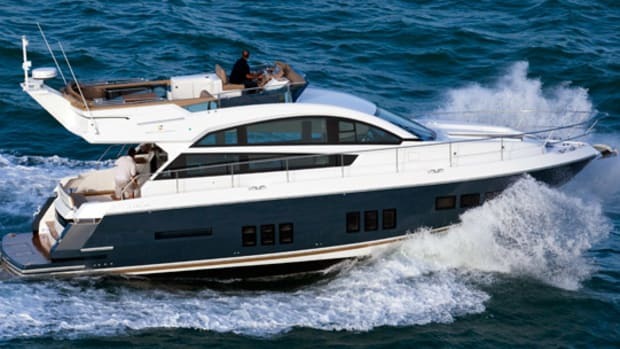 The helm is also reminiscent of other Fairlines, and that&apos;s a compliment. There are excellent sightlines forward and a panel with good, clean, ergonomic design. Seating is on twin Recaros that adjusted more ways than my body could, and there&apos;s enough space between and behind them so that one occupant can come or go without disturbing the other—something missing on a lot of competitive boats. I also liked the VDO analog gauges that also display digital information in a small window and so supplement the electronic engine readouts. The flying bridge, accessed from the cockpit, sports those same gauges (but no Cat displays), even better sightlines, and to the helmsman&apos;s left, a nifty double seat that folds flat to join a forward sunpad, creating what can only be described as a playpen that&apos;s sheltered by a big, effective windshield/wind deflector. Those occupying areas abaft the helm can avail themselves of expansive circular seating, a barbecue, &apos;fridge, and sink. The one thing missing from our bridge was a bimini top, and fitting one could, in my opinion, be a problem, because it would almost certainly mar the 66&apos;s luscious lines. I admit, I liked the stares those lines generated as I returned the 66 to her slip. But I also took pleasure in what those admirers didn&apos;t know: This beauty is also a brute.